Usually, when a company as big as Discover Bank announces good news, it means it’s because the consumer has contributed to higher profits or the company has just unveiled a successful new marketing tactic; interesting, especially to Wall Street, but not necessarily of any interest to the everyday consumer. This time, however, Discover CEO David Nelm said the “slow, single-digit growth” his company expects through the end of the year bodes well for everyone, including his customers who carry Discover credit cards. He says his team expects fewer defaults and higher spending. Those two dynamics alone make for an impressive bottom line in any industry and the economy as a whole. In the past several weeks, you have likely heard of the potential new rules various banks and credit card companies are considering, include capping debit card purchases and some credit card transactions. This is because the 2009 Credit Card Reform Act limited how much these banks and companies could charge per transaction. What once was around .44 cents the company charged a merchant anytime a credit card was used is now closer to .12 cents. That doesn’t leave much for these companies to pay their bills. Their solution, and the only one so far, is to cap charges. That would force consumers to either withdraw cash on a more regular basis (which also might include additional charges) or to use traditional paper checks. Anyone who’s grown used to the convenience of their debit and credit cards knows that’s not something they want to begin doing again. Even the cost of having a checking account is on the rise as many banks are now considering heftier monthly fees. What hasn’t been reported as heavily, however, is the fact both Discover and American Express not only issue their credit cards, but they serve as their own transactions processor, too. These two brands don’t have to share that .12 cents with other partners. Read: there’s a good possibility if you own a Discover or American Express card, you won’t be facing those spending caps should they come to pass. 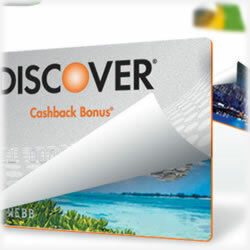 When a credit card company is doing as well as Discover is, they tend to share the good. This might mean a reintroduction of some of those perks we’ve all had to do without in these tough economic times. And if you’re wondering, the company’s profits took a huge 7% leap in profits from last year to the current calendar year. In fact, customers of the credit card giant have spent almost $24 billion in the past year. This is especially interesting since other credit card companies, including Capital One Financial, are reporting losses. In short, cardholders are spending more and then fewer of them are defaulting on their balances. This is encouraging in many ways, especially for those who love good perks such as airline miles and other incentives. So does this mean other credit card companies may soon enter the processing game? It’s possible, especially if these interchange fees and spending caps fail approval in July (the first draft is expected to be completed by April with revisions between then and July). JPMorgan is leading the way and has already said efforts to use one of its debit cards as a credit card would not bypass the $50 transaction limit. Chase Bank has already stopped its practice of issuing debit rewards cards. The company has yet to make a public statement regarding this decision when it was made March 10 and requests by the media remain unacknowledged. Other companies including Bank of America have also declined to elaborate. It’s still too soon to tell what might ultimately happen, but today’s news from Nelm suggests despite the conflicting messages in the financial sector, the credit card industry might once again be on the upswing and that’s good for anyone who relies on his credit card.